Founders Metropolitan Community Church Los Angeles has dedicated our “Illumination “ sculpture to Reverend Elder Dr. 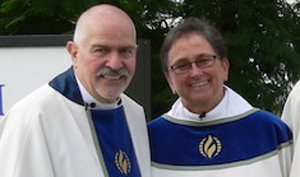 Troy D Perry, Founder of our denomination, and Reverend Elder Dr. Nancy Wilson, current Moderator. Both have served as former Senior Pastors of Founders MCCLA. The two center flames are named in their honor and remind us of the pioneering work they have contributed to the world – sharing their light with the World. Founders MCCLA wanted the sculpture to be not only an inspirational work of art, but also to serve as a donation wall, with individual pieces suitable for engraving to remember, honor and commemorate important events in our lives. The sculpture surpasses the traditional “memorial donation tree” and brings to life our logo with contemporary, amazing and breath-taking beauty. Purchasing a piece on the sculpture will place your memory, your event, your name in history as a permanent reminder and commemoration and, through your donation, offer a way to increase the light that has already been brought to the world through the work of Founders Metropolitan Community Church.This extraordinary opportunity will support and sustain the work of Founders MCCLA and the work of our global ministry.For more information on how you can be a part of history, please contact “The Illumination Project” at Founders MCCLA: 323.669.3434. How will the money raised through the “Illumination Project” be used? Every dollar raised through this special fundraiser will go toward the complete renovation of our new campus located at 4607 Prospect Avenue, Los Angeles, CA 90027, ensuring our future and providing much needed facilities for our growing congregation, pr0grams and community support. Tiles start at $250 and the most expensive tiles are $2,500. These tiles are on the top flame dedicated to Reverend Elder Troy D. Perry. They can be purchased in one lump sum or over 12/24/36 months. Each tile carries your personal dedication. Thank you in advance for your consideration of supporting our important work as we “Share our Light with the World” and offer a symbol of hope and healing as we “tear down walls and build up hope” for this generation and the generations to come.